There is a fascination about rockets that delights children and adults alike. The arc of smoke, the idea of flight, and the fun of action at a distance combine to make rockets a wonderful toy. To these pleasures we will add the forbidden glee of playing with matches, and the satisfaction of learning how something magical actually works. Unlike most of the rest of this book, this really is rocket science. The rockets we are about to build are perhaps the smallest toys in this book. They travel about ten feet, which is nonetheless 150 times their length. They are hot to the touch, and can blister a hand that catches them, so care must be used to fire them only outdoors, on a fireproof surface such as a driveway. Since they are notoriously inaccurate, the center of the driveway is suggested, so they don't land in dry grass somewhere. As always when playing with things that burn, a source of water such as a bucket or garden hose should be nearby in case of accidents. These rockets are made out of aluminum foil and match heads, and take less than a minute each to manufacture. You will need a book of paper matches (or a box of wooden matches), a sheet of aluminum foil, a pair of scissors, a paper clip, and a straight pin. 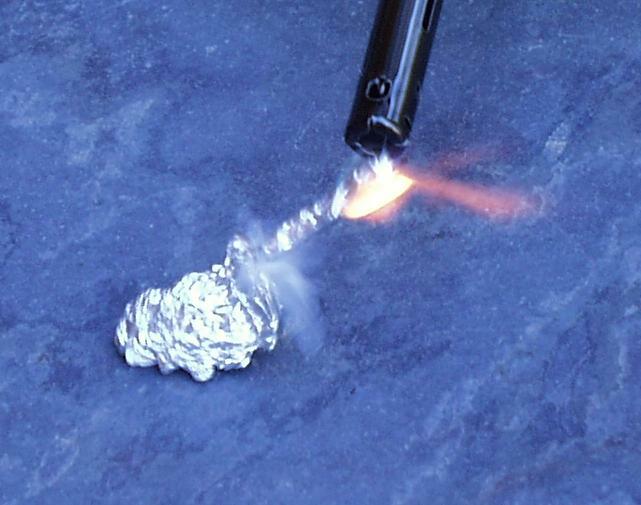 Start by cutting a narrow strip of aluminum foil, about 1 inch wide and three inches long. Tear the head off of a paper match (or cut it off with the scissors), leaving as little of the paper as possible attached to the matchhead. Set the matchhead on the foil near one end, with the top of the head facing down towards you. 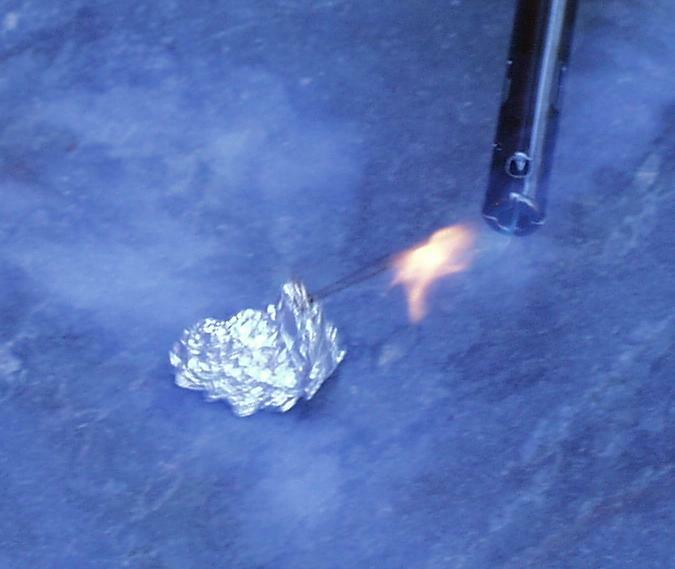 Roll the edge of the foil over the matchhead, forming a tube with the matchhead firmly in the center. Unfold the paper clip and insert one end of the wire into the tube so it touches the top of the matchhead (not the paper). Now press the foil tube flat to hold everything in place. Fold the foil over one more time (or twice if you like), and tear off the excess foil. Now twist the foil at the free end tightly (without tearing it). Twist the end with the paper clip tightly around the paper clip, keeping the wire touching the matchhead at all times. Lastly, cut off the excess foil from the top of the rocket (the end away from the paper clip). We are now finished with the rocket, and we are ready to build the launcher. The rocket launcher is a straight pin stuck through a piece of cardboard (such as an empty matchbook) or a wad of aluminum foil. The pin should point upwards at a 45 degree angle. The rocket is removed from the paper clip, and slipped over the pin, so the pin is now where the paper clip used to be. To launch the rocket, first aim it in a safe direction, where it won't start a fire or melt anything it hits. Then light a match, and hold it under the rocket. 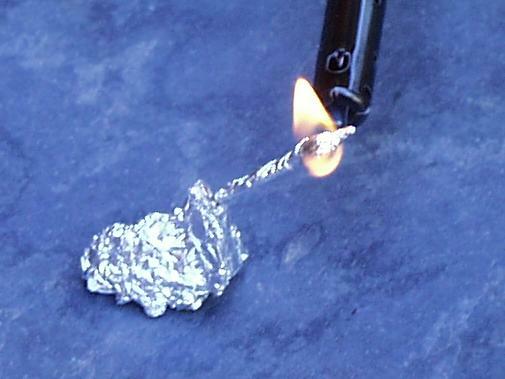 The heat of the flame will cause the matchhead to catch fire inside the foil. The hot gases from the matchhead will have only one way to escape -- through the hole where the pin is. As the gases go one way, the rocket goes the other, with a sharp hiss, and a trail of smoke. Depending on how big the matchhead was, and how much foil was used, the rocket will travel anywhere from a few inches to 20 feet. 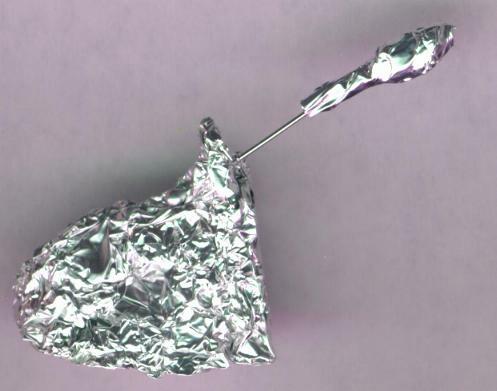 If your rocket does not fly, but instead bursts through the side of the foil, you need to build one with more foil (by rolling it one more time before tearing off the excess foil). If it hisses but doesn't leave the pin, check to make sure that the rocket slides easily up and down the pin. The pin should not block the tube completely, but should leave some space between it and the foil. In other words, the pin should be skinnier than the paper clip. Be careful not to squash the tube flat while handling the rocket. A matchhead makes a good rocket fuel because it carries both the burnable material and the oxygen needed to burn it. The burnable material in this case is the sulfur in the matchhead. The oxygen comes from compounds like potassium chlorate and potassium nitrate that are mixed with the sulfur. When the matchhead is heated, the sulfur and the potassium chlorate combine to make sulfur dioxide gas, and potassium chloride. This generates a lot of heat, which heats up the gases. The hot gases are under a lot of pressure, and their molecules hit the walls of the rocket at great speed. Where the nozzle of the rocket lets the gases out, there is no wall to hit, so there are no molecules pushing in that direction. The difference in pressure between the nozzle end (no pressure) and the opposite end (high pressure) is what pushes the rocket forwards.